I configured my wordpress and blogger blogs in Flickr and use the “Blog This” button myself. Sure Treasa – that doesn’t give me the options I have when I am inserting an image into the middle of a post using the WordPress backend. If I want to add tags, categories and possibly a trackback or two it is easier for me to do it the way I outlined above. Very useful Tom, do you have a blog on how to use tags by any chance? Tks so much Tom. Even I managed to add photos following your instructions! Thank you so much for this! I was googling around for about an hour, reading so many posts about how bandwidth stealing is bad. Yep, I know (though many people don’t), but this is the first one that actually told me how not to do it. What if I do not want that the picture would be clickable? 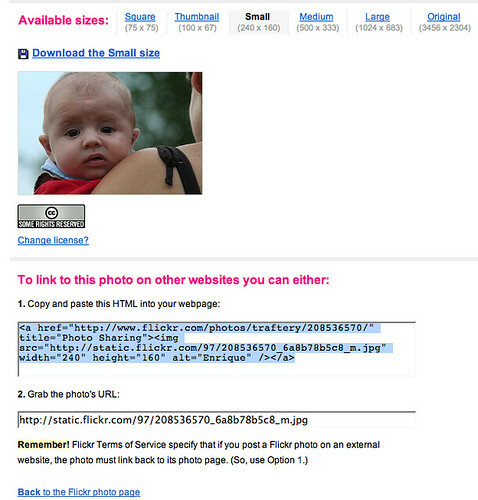 I inserted the HTML code in my blog, but if I click on the picture, my Flickr page comes up. Could you give me an advice on that?